Islamic Human Rights Commission (IHRC) strongly condemns the killings by armed police of two peaceful protestors in the northern Nigerian city of Kaduna. The dead were among thousands who had turned out to protest against the ongoing detention of the leader of the country’s Islamic Movement, Sheikh Zakzaky. It was the second day in succession that armed police had opened fire with live ammunition on peaceful pro-Zakzaky protestors. On Wednesday at least three people were wounded, one of them critically in another protest. 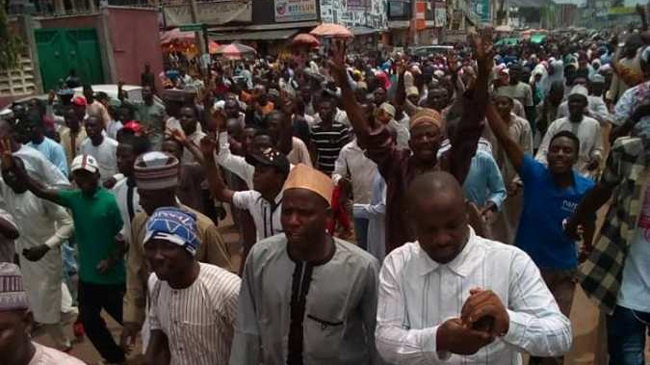 The Islamic Movement has issued a statement accusing the security forces of planning to sabotage the demonstrations and also attack pro-Zakzaky protestors in their own homes in cahoots with hired thugs. The Movement reminded people that is is committed to upholding the law at all times and that in its 30 years it has never avocated or employed violence. Sheikh Ibrahim el-Zakzaky and his wife were arraigned by the state High Court in Kaduna in May in the latest in a long line of blows inflicted on the sheikh designed to cripple the Islamic Movement of Nigeria which he leads. The authorities allege that the sheikh and supporters of his group abetted the commission of culpable homicide when they blocked roads in the city of Zaria in December 2015. In reality the charges seem to be designed to deflect government responsibility for a planned and systematic attack by soldiers on the Islamic Movement that left at least 1000 civilians dead in December 2015, an attack which is now the subject of a preliminary investigation by the International Criminal Court. Police violence against the supporters of Sheikh Zakzaky is nothing new. In April police snipers in the centre of the Nigerian capital Abuja opened fire at a Free Zakzaky protest killing at least one and injuring two. Since 8 January 2018 at least six protestors have been killed by security forces. Hundreds more have been arrested and sustained injuries from beatings during their detention. The majority of those freed were released without charge. At least 1000 civilians, mostly Islamic Movement supporters, were killed in the attacks and hundreds arrested in the attacks. In March 2016 IHRC petitioned the International Criminal Court to open a preliminary inquiry into the December 2015 massacre of IMN members.